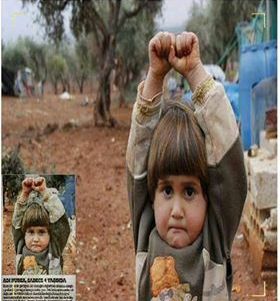 A reporter came and wanted to photograph this little syrian girl. She thought the camera was a weapon, so she surrendered. Looking into her eyes, all I can think of is how much her soul is damaged. Will life ever do justice to her childhood and bring back a smile to this angelic face? This entry was posted in persecuted Christians, suffering of children in war, war aleppo syria. Bookmark the permalink.